The theory of the houses according to Alfred Witte. 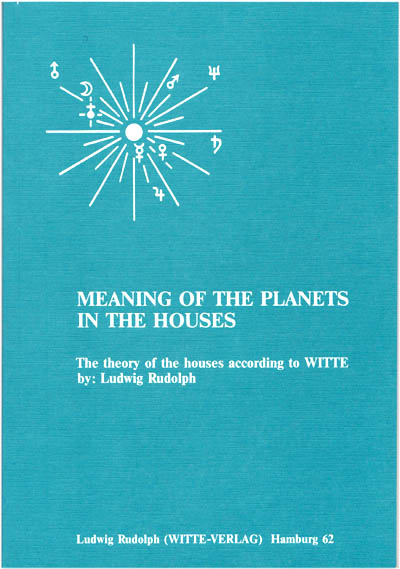 Ludwig Rudolph’s "Meaning of the Planets in the Houses. 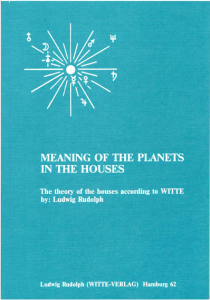 The theory of the houses according to Witte" was first published in the 4th Edition of the German "Rules for Planetary Pictures", which Ludwig Rudolph prepared together with Hermann Lefeldt (completed in 1946). For the 5th Edition in the late 1950ies, "Meaning of the Planets ..." was published a in separate work. Only the theoretical part and the basic meanings of planets and houses, remained in the Rulesbook 5. Measured by quantity of translations, this work is the most successful publication of the Witte-Verlag Publishing. It was translated into Thai, Latvian, Russian, Japanese, Estonian and English. So it became a worldwide standard work about Uranian System of Astrology (System Hamburger Schule) for the meaning of the Planets (Factors) and the Uranian Houses.